I carry a handgun daily for personal defense, as I am sure many of you do, as well. Our reasons for making the decision to carry are as varied as the decisions on what firearm to carry. Some prefer polymer framed handguns, while others are more comfortable with small framed revolvers. My personal preference lies in the most proliferate of all of John Moses Browning’s designs: The M1911. That is not to say that I don’t carry other types of handguns, as I have on several occasions. I have carried everything from Glocks to Walthers, Ruger revolvers to 3rd Generation Smith and Wesson “Wondernines” and the list is long and distinguished. 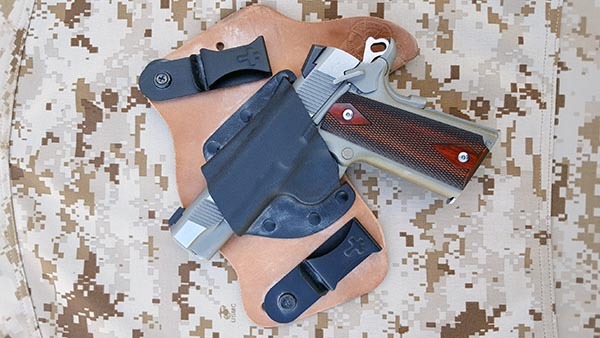 Regardless of what passing fancy I may have with carrying the latest “best thing out there for personal defense,” I always end up back where I started out over 23 years ago–with a 1911 in the holster. Why do I choose a design that passed its century mark several years ago? In short, because it works. Now I know there are a long list of internet celebrities and gun enthusiasts that would argue that the 1911 is an outdated design, that it is unreliable and that you would be better beating a would-be attacker with it than firing it at them. To them I would say “mmm … whatever,” then I would shutoff the computer and head out to the range with my trusted friend and get in some practice time. We are all welcome to our own opinions, but there is an age old saying about opinions as well. Opinions are like … well, you know. Now I don’t claim to be a tactical expert gunfighter ninja, but I have carried and shot numerous firearms over the years both personally and in the line of duty as a United States Marine. I would like to take this moment to address some of well documented criticisms of the 1911 and there are many, but I would like to stick to the main ones that keep getting thrown about over and over. Mainly its age, reliability, concealability, and safety. Is the 1911 Outdated or obsolete? “Why would you want to trust your life to a pistol that was designed over 100 years ago?” or, “Why wouldn’t you use a pistol that’s proven itself over and over again in combat for the last 107 years?” Either way you look at it, the age of the 1911 is one of the most ridiculous arguments for or against the defensive use of the pistol. It either works or it doesn’t, there isn’t any in-between. The fact is, most of the leading semi-automatic handguns on the market today owe their existence to John Moses Browning (waits for screaming and booing to subside). None of the current crop of industry leading pistols are gas operated, they are some variant of locked breech, short recoil operated system. Upon firing, the barrel and slide move rearward together until the barrel cams downward unlocking the breach and allowing the slide to complete rearward travel and continue the cycle. Most of these pistols use a cam and ramp arrangement instead of a barrel link like the 1911. The use of a cam and ramp instead of a barrel link was used in the development of the P-35 service pistol, better known to the world as the Browning Hi-power. This short recoil, locked breech mechanism is found in most modern pistols today. Now I will admit that while some manufacturers have tweaked the design a bit to fit their needs and to address what some believe to be flaws in the design, the basics of the short recoil, locked breech still have Browning written all over them. As they say, there is nothing new under the sun. Reliable? Even a broken clock is right twice a day. I have seen a lot written about the reliability or lack thereof when it comes to the 1911. There are plenty of people who refer to them as jam-o-matics or just plain junk. Still many others state they were designed with full metal jacket ammo in mind and that is all they are good for. Still others complain that after spending $800-$1000 on a 1911, they had to spend another fortune at the gunsmith’s shop to get them to run reliably. I will admit that my initial foray into the 1911 world was a finicky piece that only worked reliably with ball ammo as well. Of course, I bought that pistol 23 years ago and most of the features that are standard now in most if not all quality 1911s were reserved for custom guns from big name gunsmiths. Yes, there was a time when a brand-new Colt could be guaranteed to need several C-notes worth of careful gunsmithing work before you could bet your life on it. I would guess that this reputation was garnered back in the days when Colt pretty much had the market to themselves, because if you wanted a 1911 you could either buy a new Colt Government Model or you could go buy a surplus 1911 that had been rebuilt a dozen times over by military armorers and rattled when you shook it due to extremely loose tolerances. Back when Colt had very little competition, they made some questionable decisions that affected the quality of their product. But those days are long since past in my opinion. Yes, they still do use MIM (metal injection molded) parts and I am certainly not a fan of the polymer mainspring housings, but I am not sure why anyone who loves poly-framed guns would beat up Colt for using a plastic part. My primary carry piece is a Colt Commander Lightweight XSE that I bought new in 2012. As of the time of this writing I have roughly 2000 rounds through it with no issues whatsoever. The only modification that was made to this pistol is that I removed the full-length guide rod and replaced it with a traditional recoil spring plug, short guide rod, and a replacement 18lb recoil spring around the 1000 round mark. I do not personally care for full length guide rods in a carry gun due to the extra weight on the nose changes the balance and feel of the pistol, but that is just a personal preference. I have owned 1911s made by just about every major manufacturer and have found them to be very reliable out of the box. Hooray for capitalism and competition! I have also read dozens of horror stories on message boards and forums across the internet. Some of the horror stories may be due to “home gunsmiths” trying to fix something that in my opinion isn’t broken to begin with and buggering up pistols that would have otherwise provided years of faithful service. Still other issues may revolve around a few lemons that found their way through the quality control and out into the local gun-stores. Of course, with the advent of the internet, rumors spread at the speed of light and there are more than a few willing trolls that just love to spread rumors of bad news and throw gas on the flames while they are at it. Given my experience with the platform I would say that some of the stories about the 1911's poor reliability should be taken with a grain of salt in this day and age. This statement only applies to factory pistols, purchased new from the retailer. Unless you have a significant amount of experience with the 1911 platform or are willing to pay a professional to repair someone else’s butcher job, then I would suggest avoiding that super great deal on a $500 Kimber. Sometimes when a deal sounds too good to be true, it is. The 1911 is just to large to effectively conceal. The more I read this the more I want to laugh my head off. I have actually been told “the 1911 is just too hard to carry concealed” by more than one person who should have known better. Having carried the 1911 concealed for almost a quarter of a century now, I will tell you that it is not impossible to conceal a full size 1911 pistol. Heck, its not even that hard, assuming you are willing to purchase a quality holster and wear clothes that don’t fit so tight that every unsightly curve of your body is exaggerated. Of course, the rules of concealed carry apply to all firearms whether it be a full size 1911, snub nosed revolver, or a Glock 19. Clothing is, like everything else, a personal choice and you should wear clothing that is large enough to cover your firearm and loose enough that your firearm will not “print” while carrying it. The clothing should also be loose enough to facilitate presentation of the pistol should the need arise. A practiced draw stroke should be as spare in movement as possible. It’s great to have a pistol so well concealed that no one knows you have it, but if you can’t get it into action without performing gyrations that would win the trophy on Dancing with the Stars, then you may as well leave it at home. Jeans and t-shirt? Inside-the-waistband does the trick. Likewise, the holster is not the place to start pinching pennies. 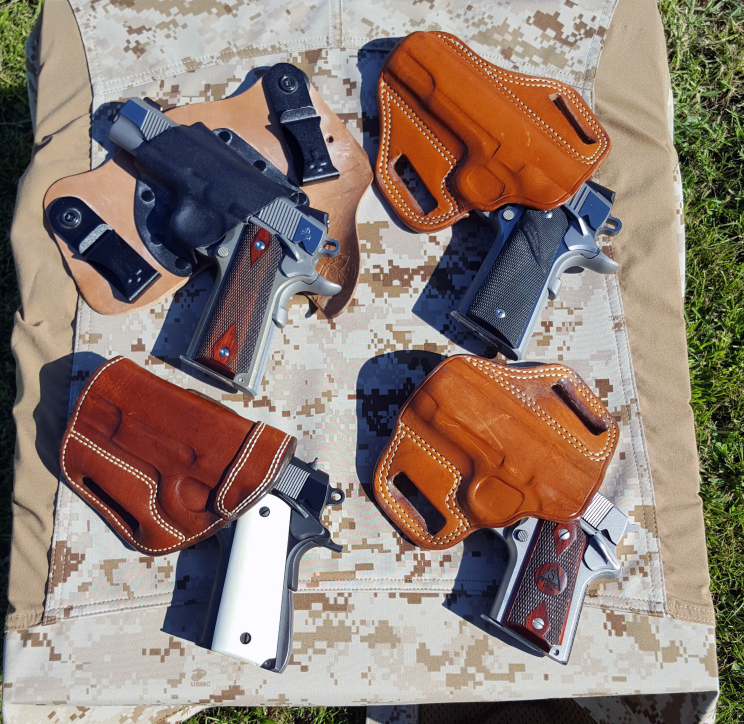 Regardless of your preferred carry position there are numerous holster makers that can provide you with quality Kydex, leather, or a combination of both. You don’t have to spend a king's ransom to score a quality holster but it doesn’t make a whole lot of sense to spend several hundred dollars on a defensive handgun and carry it in a $10 holster that is going to last all of 6 months before the stitches wear out and the holster falls apart. You also don't want a poorly designed holster with zero retention that allows that $2000 custom built wonder-pistol to fall out onto the ground. Detonics Combat Master MC2 in a well worn Galco Combat Master. Good gun-leather has more to do with concealment than the pistol does in my opinion and I have a couple of dresser drawers worth of holsters to prove it. I have tried several different carry positions and several different companies and have had good results with both leather and Kydex. The choice of carry position and material are going to be different for everyone based on build and personal preference. 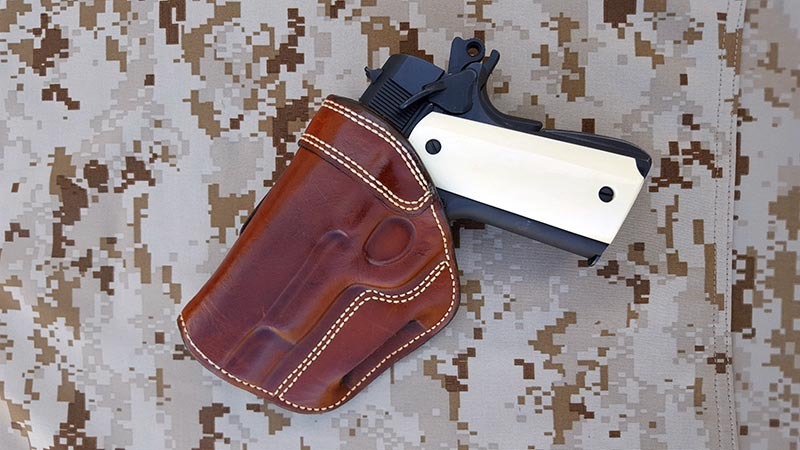 You do however want to look for a holster that hugs close to your torso with good retention that is made from quality materials to give you years of service. When it comes to quality holsters, sometimes you get what you pay for. Is the 1911 safe to carry, or inherently unsafe? This is one issue that I personally believe has more to do with the user than the inherent safety of the firearm. That being said training with your chosen firearm is paramount to its safe use, regardless of what make or model of firearm you choose. When it comes to safety, the 1911 is at least as safe as any other firearm made. Even more so for the Series 80 variant with its firing pin block that keeps the pistol from firing if dropped. A Series 80 Colt has 3 safeties, the thumb safety which is an active safety, the grip safety, and the firing pin block both of which are passive safeties. When the thumb safety is engaged the sear is locked in position and there is no way for the hammer to fall and contact the firing pin to fire the pistol. If for some reason the user forgets to engage the thumb safety prior to holstering the pistol or drops it with the thumb safety disengaged it still will not fire due to the passive safeties. For the pistol to fire the firing pin block must be disengaged and for that to happen the trigger must be pulled to the rear, which requires disengagement of the grip safety before the trigger can be pulled. The Combat Commander and Delta Elite are examples of Series 80 pistols. Mechanically speaking the 1911 with a series 80 style system is every bit as safe as a Glock with its safe action system. The main difference being that the Glock lacks the active safety lever that must be manually engaged and disengaged. It is equipped with the passive trigger safety and the firing pin block. It has long been said that the most important safety lies between your ears and that still is true. I have seen just as many negligent discharges with Glocks and revolvers as I have with 1911s. Following the basic rules of firearms handling will do more to keep you and others around you safer than any levers or firing pin blocks or bio-metric locks will. So why do I choose the 1911 to protect myself and most importantly, my family? One word, confidence. Over the many years I have spent utilizing firearms for sport and defense, I have developed a long-standing love affair with John Browning’s most everlasting design. My affection for the 1911 is based on countless rounds placed center mass on target. One of the testaments to the design is that it is perhaps the most prolific pistol in existence, there are models to fit every person or occasion. Are you a large stature guy looking for a double stack 9mm? There is a 1911 for you. Summer time in shorts and flip flops? Numerous companies make an Officer's sized model from the Kimber Ultras to the Springfield EMP, and don’t forget the granddaddy of compact 1911s, the Detonics Combat Master is a viable pistol. Looking for a mid-size single stack 1911 that recoils like a 9mm but hits like a .45 ACP? Then maybe a Commander in .38 Super. Don’t like pistols with internal extractors? Both Smith and Wesson and Sig Sauer make 1911s with an external extractor, both are reliable out of the box. Prefer a polymer frame? Rock River and EAA make polymer framed 1911s to suit your fancy. In short there is a 1911 to fit everyone’s tastes from the budget minded buyer to the recent Powerball winner who is looking to purchase an heirloom quality pistol to be handed down for future generations. Are there some losers out there? Sure, every family has a black sheep. But a quality 1911 from a reputable company is a firearm that will give you years of faithful service. What about you? Do you own a 1911? Better yet, do you trust your life to one? Or, maybe you hate this classic design? Let us know in the comments below. Joseph “Joe” Roberts is a retired Marine Master Sergeant with 21 years of active service in the United States Marine Corps. He was introduced to firearms by his parents when he was 12 years old, starting out hunting soda cans with an old single shot .22 rifle. At 13 he graduated up to big bore handguns and thus began his lifelong love affair with John Browning’s masterpiece and the Remington .44 Magnum. During his time in the Marines Joe qualified with the M16A2 service rifle, the M4 Carbine and the M9 service pistol. He also served as an M249 SAW gunner and spent time on patrols in Somalia with “Corinne”, his M60E3 Light Machine Gun. 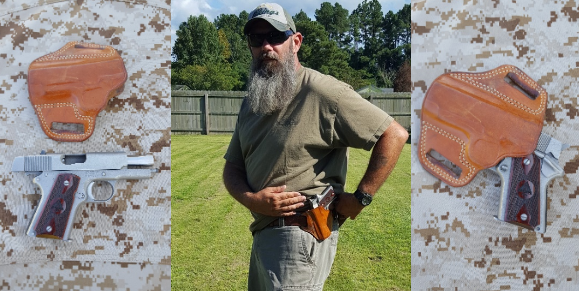 Since retiring from Active Duty Joe has worked as a DoD Support Contractor and is an amateur gunsmith as well as an avid firearms collector and shooter. His main claim to fame was 5 minutes onscreen with R. Lee Ermey in an episode of “Mail Call” from Afghanistan. He is larger than life and twice as ugly according to his wife and children. 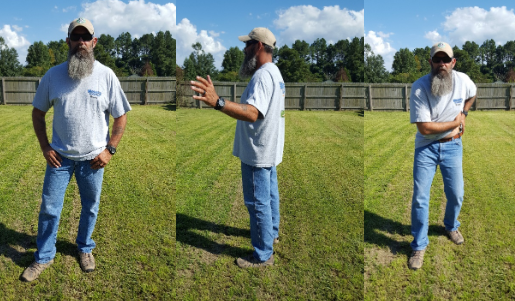 4 Responses to Is The Concealed Carry 1911 Still A Viable Option? I am Joe’s mom and am very proud of him and his family. I thoroughly agree with Joe about training. Whatever one chooses to carry learn to KNOW your firearm and train, train, train so that if need should arise you will handle it smoothly and not shoot something you shouldn’t. Currently I live where it would be futile to have a firearm, let alone, carry (Canada) I do not agree with certain laws here but as I am a guest (permanent resident) in this country I WILL respect and abide by it’s law. If ever back in the U.S. to live will again own a pistol of some sort. I will NOT however, carry until having done the above, train, train, train, learn safety, go to the firing range and shoot until handling that firearm SAFELY becomes 2nd nature. Of course I am partial when I say you GO son! again an outstanding article. I carry a Para Ord P-14-45 with two spare magazines in Kydex IWB as my everyday carry. I have to dress appropriately to pull it off. I think the 1911 platform is still viable today. I agree that the larger frames are a bit much but you have to work with what you have. keep up the great content. Train and train again. Great article. Thank you for your service. For me the 1911 is what I too also always come back to. Funny thing the spell Browning put inside this masterpiece. I have tested myself along multiple platforms over ther the years. Always shoot the 1911 quicker and more accurately. Also, there is just something that cannot be explained when you hold one that you dont get with any other platform. Leave a Reply to frankjbonazza3 Click here to cancel reply.